Do you remember when everyone had a landline? I do. In fact, I remember the days when a phone number with a nine was a thorn in your side because it took longer to dial. It wasn’t that long ago. I also remember when Twitter, LinkedIn, and Facebook were the only social media platforms that marketers really needed to pay attention to. Today, we’re balancing Instagram, Snapchat, Blab, Periscope, and whatever makes the front page of Product Hunt tomorrow. But as the networks change, so do the best practices surrounding what you should and shouldn’t be doing. 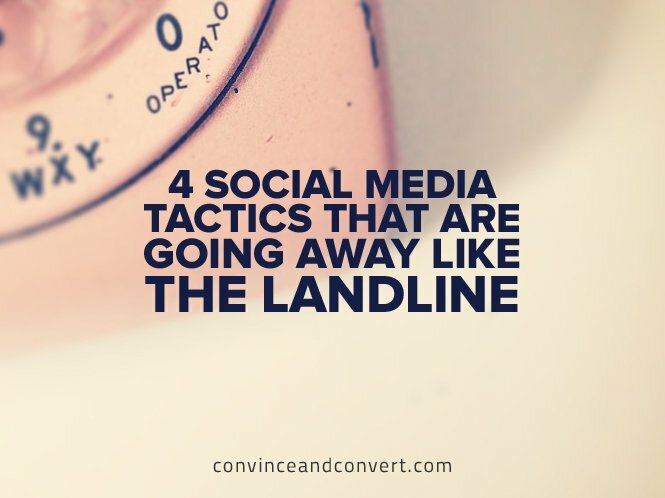 In this blog post, I’m going to share with you four social media tactics that are going away like the landline. Retweets are the way you pass along a tweet from someone else to the people who follow you. Until recently, the only way to do a retweet was to copy and paste the tweet, mention the users Twitter handle after “RT,” and place the tweet after this sequence. Some still use this approach, but it’s quickly becoming old news. There are now two types of native retweets that are built directly into Twitters platform. In both circumstances, the user who is retweeted gets a notification, and the person who does the retweeting is having the content shared to their followers. Because this is now possible without the cut/paste and addition of an RT, the old approach to retweets is falling by the wayside. One of the primary reasons people liked RT’s was because they could add a bit of context or commentary. Now, quote retweets allows the users to do this without staying restrained to the 140 character count. Once upon a time, the number of connections you had on LinkedIn was a badge of honor. Today, it’s an indication that you’re simply a connections collector and possibly someone looking to spam people online. Tip 1: Don’t add people to LinkedIn you don’t know. Tip 2: If you’re looking to connect with someone for the first time, add context. Tip 3: Don’t go in for the sale immediately. Nurture the relationship first. If you’re going to send a request to someone who you have only met once or twice, give some context in your initial message. You don’t want to give off the vibe that you’re someone who is looking to spam them or clutter their newsfeed with memes and quizzes. While some of these are going away, this one is already gone. If you’re still sending automatic DMs on Twitter, the time to stop is now. This tactic worked before everyone realized it was an automated system. You may be able to trick a few people into thinking it’s a real automated message, but those who know better will potentially unfollow you just because of it. There’s a lot of debate about automation on social media, but I believe there’s a place for it in the marketing mix. Scheduling content to be shared later with tools like Buffer or Crate is something I can support. But insincere DMs that pretend to be genuine? That’s not a tactic I can get behind. Similar to RTs and Auto DMs, once upon a time simple hashtags like #Marketing or #SEO would help you uncover great resources on the topic. Today, because Twitter is filled with millions of people and thousands of bots, these one-word hashtags don’t carry the same weight they once did. Instead of stuffing your tweet with a bunch of different hashtags, take the time to understand a niche hashtag that only a small group of people is using. You can use a hashtag like #GrowthHacking or #SMM for an immediate like, but the engagement is likely to be connected to bots. You want to use hashtags that will place your content in front of real people with an actual interest in your topic. It’s no secret that social media changes frequently. We all know this. The key to sustaining long-term success on social media is in our ability to adapt to the latest trends and ensure that we’re aware of the tides as they change.